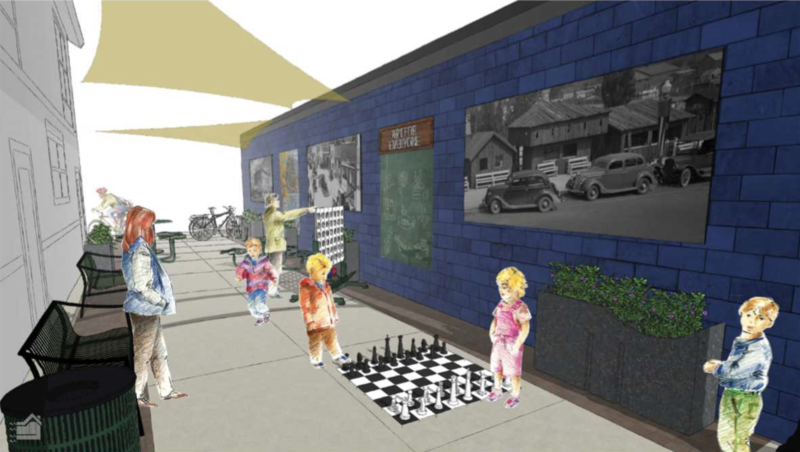 An alleyway in downtown Charlevoix will be transformed into an interactive space, improving walkability and adding to the vibrancy of town through a new crowdfunding campaign. If the campaign reaches its crowdfunding goal of $6,000 by April 30, 2019, the project will win a matching grant with funds made possible by the MEDC’s Public Spaces Community Places program. The campaign is being offered through Michigan-based crowdfunding platform Patronicity. “Alleys are often an uncomfortable means to a destination in our downtowns, but as creative placemakers put their minds together to activate these spaces, they become vibrant places to gather and spend time,” said MEDC Senior Vice President of Community Development Katharine Czarnecki. Public Spaces Community Places is a collaborative effort of the MEDC, the Michigan Municipal League and Patronicity, in which local residents can use crowdfunding to be part of the development of strategic projects in their communities and be backed with a matching grant from MEDC. The Public Spaces Community Places initiative started in 2014 with MEDC providing matched funding of up to $50,000 for community improvement projects throughout Michigan. As of March 20, 2019, MEDC has provided more than $6 million in matching grants. Since the launch of the program, 199 projects have been successful in reaching their goal, with $7.2 million raised from 37,899 individual donors.